The story of the Porsche 911 Carrera 2.7 RS is well documented here at Total 911. However, it has now been 40 years since the famous 2,687cc flat six engine was last fitted to a production car at Zuffenhausen. Prior to the Carrera RS, on the race track, Porsche had been campaigning an upgraded version of the 2.4-litre Porsche 911S (known as STs). However, thanks to the class structure, that car could only have an engine enlarged to 2.5 litres, leaving Zuffenhausen lagging behind the competition. For the 1973 racing season, Porsche needed a bigger engine. Initially, Zuffenhausen’s engineers were at a loss as how to achieve this. Not only was the 911 shell originally designed for a 2.0-litre engine but, the 2.5-litre flat sixes in the 911 STs were bored out as much as Porsche dared take them. An answer came through Porsche’s experience with the 917 prototype. The Nikasil cylinder coating developed for the 917 allowed the 911’s barrels to be bored out to 90mm without losing too much strength. The nickel-silicon carbide material also provided less friction compared to Biral cylinders. Combined with the 70.4mm stroke from the 2.4-litre cars, the new engine measured in at 2,687cc (allowing it to be enlarged all the way up to 3.0 litres, if need be, for racing purposes). Codenamed the 911/83 engine, the new flat six featured a magnesium crankcase providing a 10kg weight saving over the previously considered aluminium version while the new barrels featured 11 cooling fins (rather than the 15 seen in the 2.4S). Like the 2.4-litre 911S, the box-type pistons remained forged and the cylinder head was largely the same with the same 8.5:1 compression ratio, valve sizes and timing. The 2.7-litre’s 20hp boost and 44Nm torque increase came solely from the greater displacement, providing totals of 210bhp and 255Nm respectively. Originally, the engine was destined for a 2.7-litre version of the 911S featuring wider arches. However, the planned new car was so extreme, the ‘S’ badge didn’t seem to do it justice. Instead Porsche settled on calling it the Carrera RS. 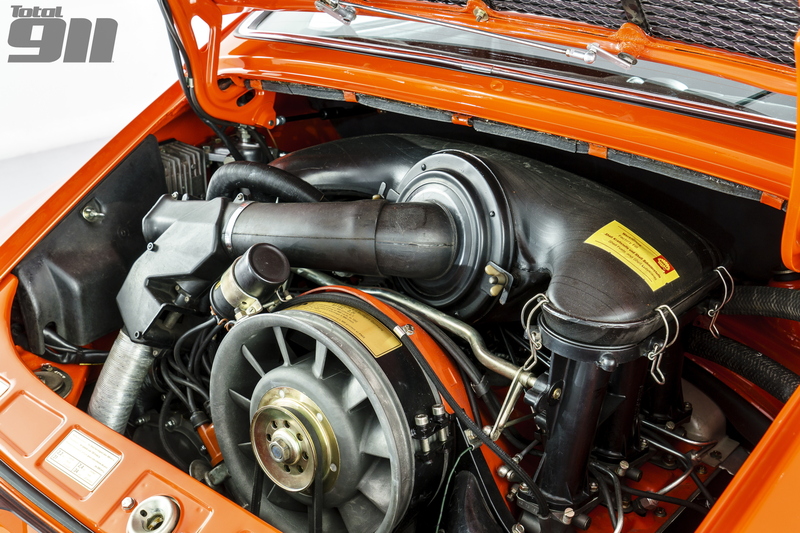 Even after production of the 2.7 Carrera RS stopped at the end of 1973, the 911/83 engine continued for another three years, fitted into the ‘Rest of World’ version of the Porsche 911 Carrera (the first 911 to sport impact bumpers).